Trademarks are wonderful for pre-E3 speculation, as they can mean nothing or - alternatively - be an early twitch ahead of an announcement. With that in mind, fans of the Kong clan should pay attention. A trademark has been filed in Europe today (10th June) for DIDDY KONG, which covers games, gaming 'apparatus' (accessories), merchandise and downloads. Of course, Diddy is already common in various games and is all over lots of Nintendo merchandise, so this could simply be some retrospective back covering. On the flipside, the timing - in the week before E3 - naturally prompts speculation. We did a search on US trademarks and found no new results, while there are no other new KONG-themed trademarks registered this week - at the time of writing - in Europe. As already stated, this could be something or nothing, but gives us some harmless speculating to do. Would you welcome a Diddy Kong-themed reveal at E3; if so, what would you like it to be? Thanks to Benson for the heads up. But what about Donkey Kong Jr.? He grew up into the fine specimen depicted in your avatar. I love Donkey Kong Country Tropical Freeze but I dont want another one. Diddy Kong Racing on the other hand: YES PLS. If this is what Retro Studios is working on I might actually cry a little bit...and not in a good way. A new Diddy Kong Racing would be sweet! @KingofSaiyans I'm with with you! I loved Diddy Kong Racing growing up on the N64. My parents couldn't get Mario Kart 64 because it was sold out so they took a chance on Diddy. We ended up loving that game and playing to for years. We never did buy MK64, either. I'd love to see a new game as I already have the DS version. I'd love a new Diddy Kong Racing so much. The single player mode blows the single player of any Mario Kart away IMO, and the only rival that even comes close is Crash Team Racing. The disappointment will be unreal. Even if its Diddy Kong Racing. Let someone else do it. Retro have better things to be doing. @Peach64 Crash Team Racing was a classic! Loved that game. Feeling the need to load it up and play a round. Please don't let this be what Retro is working on. If Retro is still doing DK stuff I'm gonna cry. Maybe it's a FPS and you go around shooting Tikis and Walruses with Diddys twin peanut guns. @RupeeClock Actually Donkey Kong Jr. is modern DK's (with tie) father. See, Donkey Kong Jr. is Donkey Kong's (arcade) son. That Donkey Kong (arcade) is Cranky Kong. And we know that Cranky Kong is modern DK's (with tie) grandfather. Therefore, modern DK (with tie) is actually Donkey Kong the Third. I've been thinking since Diddy was left out of Mario Kart that a sequel to DKR could finally happen. I really wonder if it's Retro doing it given their work on Donkey Kong and Mario Kart 8. I could also see Monster Games doing/collaborating on it given their background in Racing games and work on the Donkey Kong Country Returns 3DS. How cool would it be if Retro was co developing this with Monster Games and making a new Metroid? I could also see it being a similar situation but with a 3rd DKC game instead, this time starring Diddy and Dixie. Interesting stuff. Oh man, it better be a new Diddy Kong Racing! The first one for N64 is still one of my favourite games ever. Whatever it will be, if it will be true, basically I am not ready for it. @Gerbwmu That sounds horrifyingly like a real iPhone game description. I'm scared. Diddy Kong Racing is one the games I've longed for a comeback and when I found out about the cancelled Donkey Kong Racing for GC last year I was gutted.If I had the choice between DKR and Metroid from Retro,I'd pick DKR. Racing rhinos through HD jungles online sounds superb to me. @DreamOn How about no. Donkey Kong already got his games this gen. Its Samus time. I take it your not a Metroid fan? At this point I actually find it ridiculous that Nintendo has to pay some other company money to protect its trademark when surely no one would have a leg to stand on if they tried to use the Diddy Kong name in their own game. Why should Nintendo even have to continue to Trademark this; other than to make some douche-bags easy money for basically doing absolutely nothing—because if someone does infringe the name then it's Nintendo who has to spend all the money and put in all the work to defend it anyway? In my opinion the Trademark office is just another thinly veiled way to basically tax people, or businesses in this case. @A01 Im all in for a new Diddy Kong Racing game by Retro and Monster games. If you're hoping for a new Metroid game I am almost positive the next one will not be developed by Retro Studios, but I may be wrong. I don't mind if it's not Metroid they're working on. I've just had enough of Donkey & Diddy Kong for now. If there must be a new Diddy Kong game, fine, let someone else do it. Retro's immense talent needs to be put to work on something, anything else. Diddy Kong Racing U. Or maybe Retro Studios went the old Donkey Kong Country route of making Diddy the star of the last game in a planned trilogy perhaps? @NintyMan you're right! I found that very strange as well thar Diddy is just gone in those games. Very odd indeed. Diddy Kong is one of my favorite Nintendo characters, so this is exciting to me. And Diddy Kong Racing is one of my favorite N64 games, so a sequel would be magnificent. @A01 I don't mind if Retro doesn't work on Metroid either. In fact, I don't even want a prime game! And it's not that I don't want Diddy Long Racing either. I just feel like Retro could make something a little more... epic. Please give us Diddy Kong Racing!!! I loved the structure of that game!!! Would love a new diddy kong racing . Loved the original, not so keen on the touch screen extras on the ds version. Mind you I also want a new metroid. So let's dream we will get both. 1. This means absolutely nothing seeing as Nintendo has done this before, with Eternal Darkness to name but one example. 2. It is indeed a new version of Diddy Kong Racing. 3. Diddy Kong will star as the main character in the last game of the Donkey Kong Country Returns trilogy. 4. 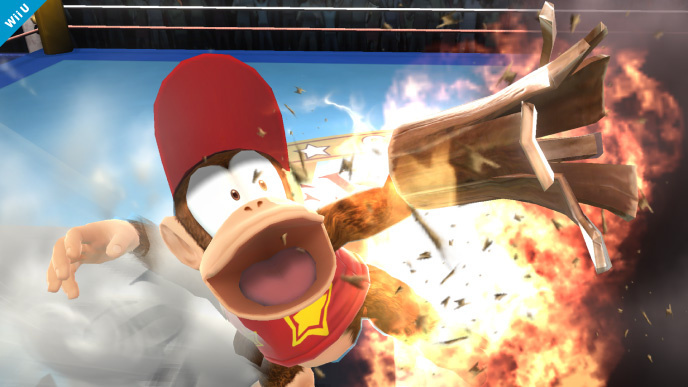 Diddy Kong is going to star in Nintendo's first smart phone game. I think it may be possible that Rare and Nintendo are still splitting up their intellectual properties. After all, Diddy Kong was invented while Rare was developing DKC for the SNES. Too bad Rare got to keep Killer Instinct. I won't get my hopes up too high since just trademarking Diddy's name may mean nothing (could just be for further merchandising security alone or anything), but please!!! If I get anything Diddy Kong related (Mario Kart 8 DLC with him in it, Diddy Kong Racing 2, new DK64, etc) I will be happy. I understand the people that hope it's not related to Retro's new game (would love to see a new Metroid or anything else from them- Retro is my favorite Nintendo subsidiary. Although I feel like the Metroid fans need to realize other companies can do Metroid also just as other companies can do DK.... Retro does everything best including DK now, they're just as known for DK as they are Metroid but DKC doesn't have a trilogy like Metroid had just yet) but I wouldn't mind another DKC type game either- especially if Diddy is the star and it's more like DKC2. I would LOVE a new DKR game. Just started playing through the original,again on my JDS and it still holds up today. Sadly, though, I can't see this being a Wii U game as MK8 and DLC is dominating that market and they wouldn't want to dilute that. At a pinch maybe a 3DS game. Best comment of the week. I'd be surprised if they did diddy kong racing, they've already done the karting thing with mario kart. however I would LOVE IT if it is. If Diddy Kong Racing is what Retro have been working on, I will hurl my Wii U out the nearest window. F*** no!! I picked up a brandnew Diddy Kong amiibo for 6,50€ so I'll be ready. Trademark renewals don't mean anything though. There were all those rumors of an awesome sounding Wii U Diddy Kong Racing that featured lesser known Nintendo characters as the playable characters like Dillon and Chibi Robo (I think those two were in the rumor I read). I mean, I read that a while back, but I'd like to think it was true because it was composed pretty well and had some fairly solid support. Plus the idea just sounds awesome to me. Retro made Wii U sequel to Diddy Kong Racing? I really hope it isn't Diddy Kong Racing, I love that game on the 64 but wouldn't want another one seeing as Retro is rumored to develop it and I don't want that. If Retro Studios is not developing the game, I say Diddy Kong Racing come on! I just want another Metroid game developed by Retro Studios. Riveting! I'd actually like to see what this is about! @whodatninja I'm with you. Must be Metroid. Retro studios has the ability to work on more than one game at a time now. Does noone realize this? Everyone is crying that it might not be Metroid they're working on. They can do both at once. Please oh please be Diddy Kong Racing 2! I wouldn't mind a new Donkey Kong Country game (sorry haters...no, wait I am not!) but I doubt it. Maybe is the Diddy Kong Racing game that "apparenty" finished a year ago but never released or maybe is nothing..
@Ananymoose I realize it, but I still want Metroid. DKR64 is great and sequel could be beautiful, but think a little more time needs to be had/made(?) until another kart game, though that doesn't stop Nintendo from releasing platformers so who knows. Hmm, interesting! Maybe a new Diddy Kong racing? Am I the only one who played the crap out of Diddy Kong Racing but doesn't want another one? Diddy kong racing 3d or wii u anyone? Im all up for another racing game for 3ds.